An example of the community’s dedication to preserving their rich heritage is Killilagh Church, whose renovation was overseen by a local voluntary group (including archaeologists) in 2013. The church, built in the 17th century, sits on a ridge above the village of Doolin. As you walk up the laneway, the first building you will see is the stone mausoleum of the McNamara’s of Doolin house. In the field on your left is a monument which is recorded as a rath, but it’s size and shape envisages that it is more likely to be a Ring Barrow, similar to the Bronze Age barrows at Doonagore. The entrance to the site of Killilagh Church is through a metal gate, into the graveyard. 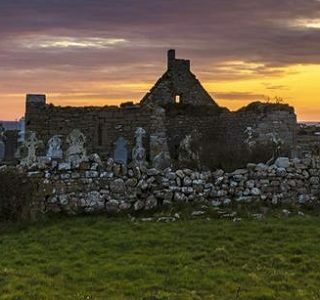 An ongoing survey being carried out by members of Doolin Heritage shows that the graveyard was in use from the early 17th century right up to the 20th century. The Church is entered through an opening in the south wall into the Nave. This originally had well cut dressed stone and the keystone was a Head of a Cleric, which is now on display in the visitor centre in nearby Kilfenora. Once in the Nave you will notice that the Church has only one gable – the West Gable. The east gable was badly damaged in a storm in the early part of the last century and was removed, fragments of which can still be seen around the Church. The style and shape of it would suggest that it was dated circa the 14th Century. A similar window can be seen in the ruin church in neighbouring Fanore. Off the nave to the south is a small chapel. There is local evidence that the windows and the stone arch came from the old tower house at Knockfinn and during the restoration work, we found slates from its roof possibly given the construction date of sometime in the 17th Century. An archaeological dig was carried out by TVAS Ireland Ltd prior to building work in 2013. During preparation work on the wall, slates were found. As part of the first phase, a large tomb was repaired. Debris and soil was removed before the wall was repointed with lime mortar. When the restoration work was finished, members of Doolin Heritage and Volunteers set about relaying the gravestones and removing Ivy. The restoration group were completely voluntary, and were delighted to welcome locally based craftsman Brian Hackett on board to the project. A Zoomorphic Brooch had been discovered by a mine worker at Toomullin (the church’s graveyard) in the 1940’s and is now in the National Museum in Dublin. Using only drawings from the 1940’s of the original, Brian reconstructed in every detail, the process they would have used to make the original in the Bronze Age. Brian made 3 brooches, two went to the USA and one found a new home in Doolin.